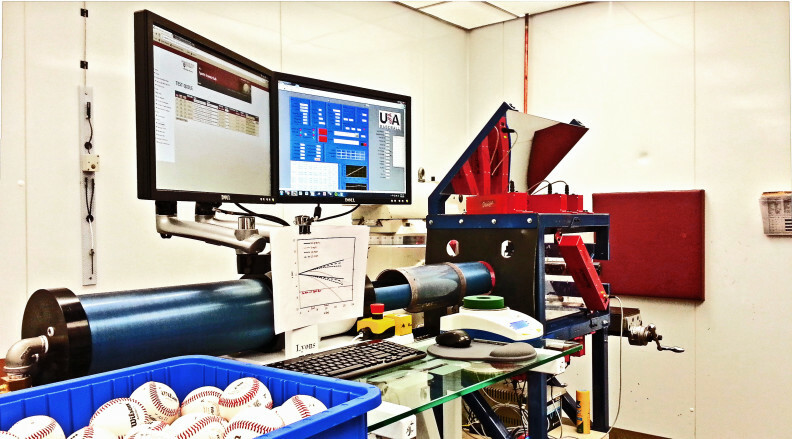 The Sports Science Laboratory (SSL) specializes in the dynamics of bat and ball collisions. The results of this work help regulating agencies better understand equipment performance through experimental testing and numeric models. The lab is certified with the NCAA, USA Softball, and USA Baseball and contracts with bat and ball manufacturers to verify compliance and evaluate prototype products. Our lab consists of Director Dr. Lloyd V. Smith, Assistant Director Jeff Kensrud, Lab Engineer Derek Nevins, Research Operations Engineer Jon Ward, Senior Research Technologist Nate Griggs, Program Specialist Tana Crawford, and a staff of Mechanical Engineering undergraduate technicians. The lab also supports graduate students who conduct sports science research. Video below was captured at 1000 frames per second in HD.